Sri Lanka Telecom (SLT), the organizers of the most popular cross country cycle race-“SLT Speed Up Sawariya”, recently organized the awards ceremony for the company’s Speed Up & Win online bicycle competition to award the top three winners of the game. The winners were recognized and awarded at the Rupavahini Morning Show-“Sanhinda” recently. The online cycle competition “Speed Up & Win” was conducted in parallel to the “SLT Speed Up Sawariya” during September 2018. Players were able to play any number of sessions of the game and climb to the top of the leader board. Over 45,000 sessions of the game was played during the SLT Speed Up Sawariya race period. The top three winners with the highest scores were selected and awarded sports mountain bikes The winner of the Speed Up & Win 2018 was Imanka Wimalsiri (Kandy), who won a bicycle worth Rs. 50,000. 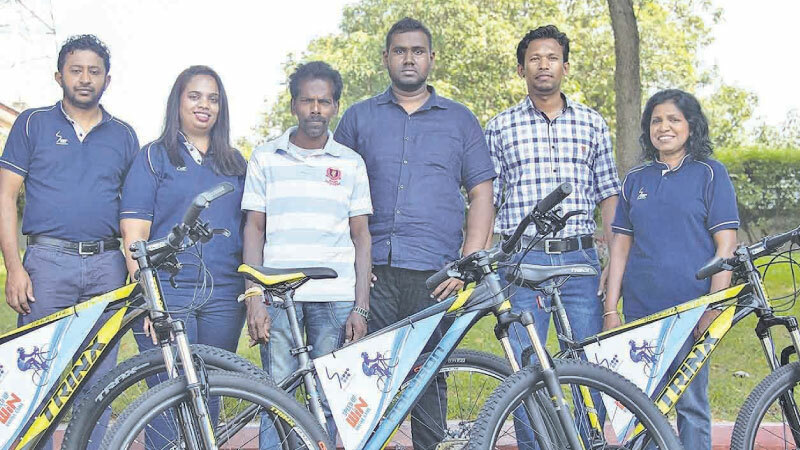 Duwage Prasanna (Maharagama) and Djathu Pusparasa (Jaffna) won the second and third places respectively and were both awarded bicycles worth Rs. 35,000 each. SLT extends its congratulations and best wishes to the winners of Speed Up& Win 2018 online competition.